Hook & band hinges are sturdy fixtures made from galvanised stainless steel, most often used in nautical applications where resistance to erosion is crucial. At Ironmongery Experts we have a dedicated selection of hook & band hinges for sale, as well as a huge range of other fixtures and fittings in the hinges range. We also stock more commonly seen models like ball race hinges and more specialised, bronze washer equipped washered hinges for those looking for modern commercial options. If you require something more ornate, our elegant range of decorative hinges offer a huge variety of options to suit your tastes. For more delicate applications, our selection of light duty hinges won’t let you down, despite their compact nature. Much like our cabinet hinges, these are designed with domestic use in mind, and are ideal for use in the kitchen. If instead you require something for the bedroom, our premier range of casement hinges are designed to work with a variety of setups. If you’re looking for something that can stand the test of time and endure use by thousands of people per day, our thrust bearing hinges provide low-friction operation and a superior lifespan. Similarly, if you need something a little more theft-resistant for your home’s front and back entrances, our range of spring hinges are perfect for this purpose. These see frequent use in the housing sector, much like our assorted broad butts for residential frames and doors. 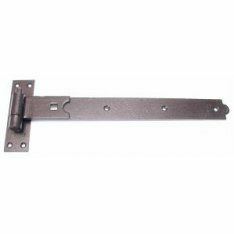 If you own a door that has to clear an obstacle upon opening, such as a beam or piece of piping, our specially designed parliament hinges make this a breeze. And if you need a hinge that’ll spread the weight of the door over a wider area, even the heaviest doors can be supported by our array of tee hinges. Speaking of heavy doors, if you plan on purchasing cast iron gates or a similar setup, you’re going to want to apply the sturdiest fixture possible – our heavy reversible hinges guarantee a rust-free and reliable function in even the harshest weather conditions, giving you peace of mind.